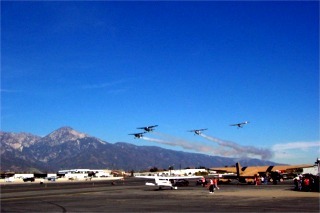 This was the 27th annual Pomona Valley Air Fair. It is at the local airport about 4 miles from the house. They have a few events over the course of the year but this was the first time we stopped. 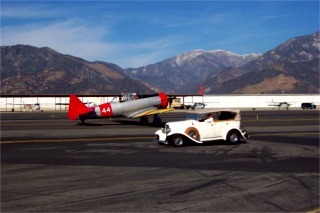 As you can see there were not only old planes but they had a car show too. I liked this shot as in the background there is some snow on Mt. San Antonio. Locals call it Mt Baldy. I couldn't tell you what these planes were as I don't know much about them. It was just a cool picture. Cable Airport is a family owned business. The admission to the air fair was $3.00. It was January and I was wearing a T-shirt and we drove there in the Miata with the top down... gotta love that. 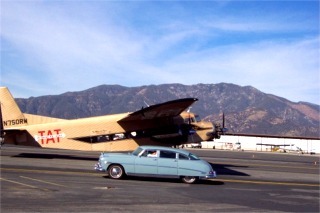 The plane here is a Ford Tri-Motor. They used to fly one of these back in Ohio to take people back and forth to the Lake Erie Islands. AND yes FORD really did manufacture planes. Like the early cars it had a reputation as being solid, safe and long lasting. 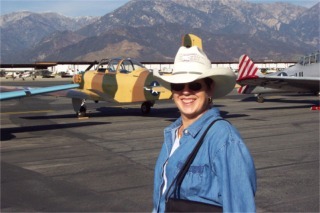 It was used by all major air carriers and the military. 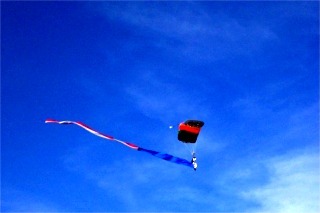 There were also parachutists. It looked very nice against a pretty blue sky.